Photo courtesy of Taipei Economic and Trade Office, Jakarta, Indonesia. Jakarta, Jan. 22 (CNA) Taiwan on Tuesday made another US$500,000 donation to Indonesia to support relief efforts following a deadly tsunami that left hundreds dead last December. The donation was made in Jakarta by Taiwan's representative to Indonesia Chen Chung (陳忠) to Ginandjar Kartasasmita, acting chairman of the Indonesian Red Cross Society. 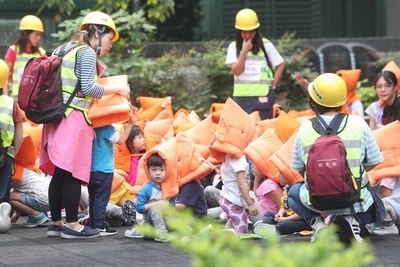 Chen, also thanked the Indonesian government and those who helped the family of six Taiwanese tourists seek medical attention after they were found stranded in a mountainous area in Lampung Province where the disaster struck. Taiwan's government has decided to make another donation to help with post-disaster relief work and aid reconstruction in areas affected by the natural disaster, Chen said. He also expressed hope that the donation would enable those impacted by the tsunami to get back on their feet as soon as possible. The tsunami, which struck several coastal regions of Banten in Java and Lampung in Sumatra on Dec. 22, left hundreds of dead and thousands injured. The tsunami was caused by an undersea landslide that followed an eruption of Anak Krakatau, also known as the "Child of Krakatoa." After the natural disaster, Taiwan's government immediately gave US$500,000 to help the country with its relief efforts in December. According to the representative, Taiwan's government also donated US$250,000 to Indonesia after a magnitude 7.0 earthquake in July left hundreds of people dead in the popular tourist destination of Lombok, and another US$1 million to the Indonesian Red Cross and the Indonesian Ulema Council (MUI) following a magnitude 7.5 earthquake that hit the island of Sulawesi Sept. 28, triggering a tsunami that resulted in the deaths of nearly 2,000 people.